When it comes to traveling, when we're preparing for a long journey, such as a trip across the country, we seem to accept the fact that Star Trek’s transporter is a fantasy and that we need to set aside the time necessary to allow the process to work. Yet, when it comes to growing a business, executives seem to believe that they can get the equivalent result of the transporter. They feel that they can come up with an idea, start marketing and customers will start appearing within 90 days. I still remember one of the wisest pieces of advice I ever got about building a successful sales organization (though I can’t remember who told me). The advice was to “spend less time figuring out how my team can sell better, and more time figuring out how to make it easier to buy.” Over time, the company that makes it easiest for customers to buy from them will typically win the game. For the B2B sale, this means creating alignment between your go-to-market approach and how the customers in your desired markets go about making and managing purchase decisions. While few will disagree with the statement I just made, the vast majority of selling organizations pay little to no attention to the journey their customers take. 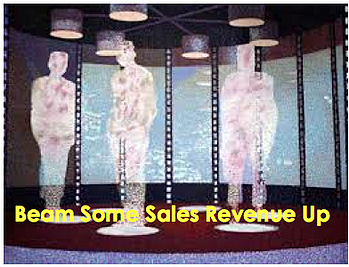 I see this all the time when executives tell me that they have sales cycles of three to six months or less. 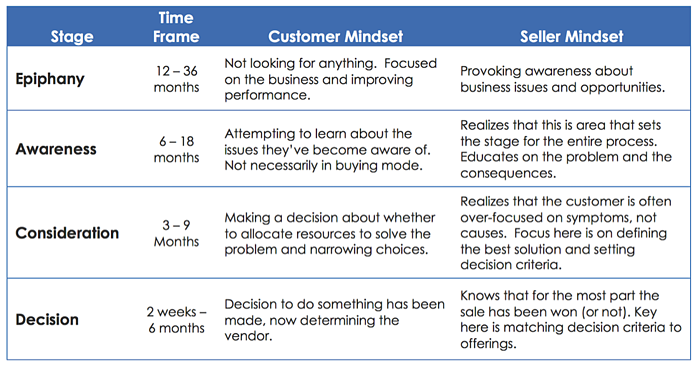 The reality is that the sales process begins long before companies view their sales cycle beginning. Last Wednesday, I made a statement in this blog that “companies that scale growth know that the sales they make today were caused by something that happened 12 – 36 months ago.” Today, I thought I’d show you how that happens. 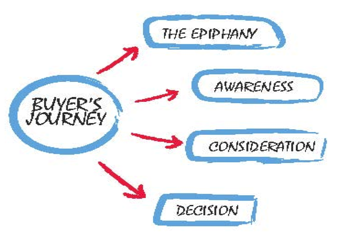 There are four distinct, fairly predictable, parts to the buyer’s journey. In this example I’m going to share some typical timelines for businesses engaged in B2B sales, where they’re providing a total solutions proposition. While there are certainly exceptions to what I’m going to share, if you build your process to align with this you’ll see material improvement. The fact of the matter is that people do not spend any time thinking about problems they don’t know they have, or solutions they don’t know exist. If your offerings are unique, disruptive or even different this stage represents tremendous opportunity for you. Customers in this stage aren’t looking for solutions. In many ways they’re not looking for anything. They’re operating their business, dealing with issues and trying to improve performance. From a sellers perspective this represents the opportunity to provoke and challenge. What’s interesting is that people are most open to being influenced before they decide what their issue is. The opportunity is to create the trigger event. At this point the customer/prospect has become aware of a problem. Now, just because they’re aware of the problem doesn’t mean their going to do anything about it, and it certainly doesn’t mean they’re ready to write you a check. At this point the customer is trying to learn about the problem and the options for solving it. They’re also trying to determine if it’s a problem that’s big enough to justify doing anything about it at all. An effective seller knows the their job here is to educate the prospect on the problem. Help them understand the real cause, and more importantly the consequence of not solving the problem. It’s where the prospect does their self-diagnosis. The manner in which the prospect defines their problem at this stage in the journey will acutely influence how they make decisions as they move further along the journey. This is the point that the customer is deciding whether they’re going to allocate resources to the problem, and to what level they’re going to attempt to solve the problem. While that sentence makes this stage sound very purposeful, the reality is that it’s often done by gut feel with no real process to support it. This is the stage where the customer starts to really pay attention to possible vendors they may use to solve the problem. This is also an important ZMOT phase for sellers. It’s important to remember that the prospect is still problem focused on this stage, not solutions focused. A seller knows that they’re still in the education phase here. They realize that the customer can easily be confusing symptoms with causes, and if they define the problem by its symptom, it is highly unlikely the prospect will fund the solution adequately. Great selling organizations understand that by this phase the sale has already been won or lost. The job here is to match the criteria the prospect has defined earlier in the journey with your solution. The problem is that most sales strategies and marketing strategies are geared to influence this phase of the journey. It’s one of the primary reasons that the affects of commoditization are being felt so acutely. The reason that so much of the effort is focused on this stage is that it worked reasonably well for 25 years. From about 1983 – 2008 demand was growing so rapidly and money was so freely available that selling organizations only needed to position themselves to catch the opportunities as they were falling. However, as a friend of mine likes to say, “Just because the fish are jumping in your boat doesn’t mean you're an angler.” When the Great Recession hit, demand fell through the floor. Even now, as demand is coming back, budgets are restricted and competition is fierce. The closer you are to The Decision Stage when you message connects, the less likely you’ll be able to influence the decision and be valued for what you are worth. The key is to build your marketing and sales process to support the entire journey. Build the assets to engage with opportunities early in their journey, and you’ll see faster growth, greater predictability and less competition.